Second on my list of favorite dime store authors is Agatha Christie. She is a genius of the mystery, usually murder most foul. 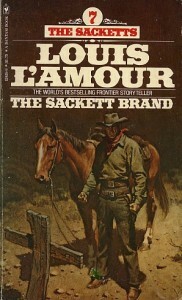 While I got an early start on reading Louis L’Amour, I started reading Agatha Christie novels in high school. This delay was probably due to a few factors, not the least of which was that they were my older sister’s favorite books so I thought they were girly. In high school, after I had burned through all of my ‘Louis’ (twice, at least), I was so desperate that I picked up some ‘Agathas’ from my dad’s library. They were instant favorites. Most Agathas include a mysterious murder and a cluster of suspects for the reader to choose from. Like all good formulas, every Agatha is different enough to tantalize the brain buds. Another important factor of is that Christie was British as they come (appealing to the Anglophile* in all of us). Christie also created two of the more memorable detectives in mystey fiction, Miss Jane Marple and Monsuir Hercule Poirot. Both are eccentrics who are easy to love. Still, the best part of every Agatha is the solution. Of course, the attentive reader has an opportunity to solve the crimes. All the characters are gathered. All of the evidence has been presented. Usually, I am so excited that I do not even stop to figure out the cases, but when I do, I have noticed some simple trends. The guilty always seem to be easily dismissed and sufficiently minor to be the obvious choice, and yet, I have never solved a mystery. Some of my favorites include The ABC Murders, Murder on the Orient Express, And Then There Were None, and At Bertram’s Hotel. Expect features on these and others in the near future. What is honor (or moral behavior or honesty or the right thing)? Lately, honor has been in the news. Some of President Obama’s nominees for Cabinet positions have been under fire because of a lack of honor in paying their taxes. Michael Phelps has made the news because he was taking a nice hit off of a bong. In my personal life, I have been discussing with my dad whether downloading media for free is illegal. All of these events hinge on a definition of honor. What exactly is honor? Is it doing the morally correct thing or doing the legally correct thing? Who defines honor? Is it a general consensus or a personal choice? What are the consequences for dishonorable behavior? Should it be retribution or is the damage to reputation sufficient? These are tough questions to answer. For most people, it is hard to develop a strong personal definition of honor. There are always ways to get around the spirit of something while meeting its letter. This kind of attitude leads to people skimping on their taxes (Tom Daschle). For others, laws seem arbitrary and impersonal, so desire is more important than legality (Michael Phelps). And for some people, the risk of consequences is minimal (illegal downloaders). Personally, I did not develop a sense of honor until I went to college. I no longer had my parents to motivate me so I looked at my schoolwork as a representation of myself. If professors thought that I was willing to cheat, I was offended (as any personal affront usually offends me, regardless of whether it impugns my skills at the ultimate or Halo or my deep knowledge of NBA basketball, or yes, my honesty). However, I broke many a law pertaining to alcohol because I felt like they were imposed on disenfranchised youth by fascist, fear-mongering adults (see Sparks). Anyway, my personal honor code is defined by my idea that morality and not legality takes precedence, which leads to strong ideals about cheating or stealing but weak feelings towards personal choices like weed or alcohol. Please, dear reader, share your own honor code in the comments. Round up: As promised, the Skor bar is the first entry for candy Saturday. The Skor bar is ‘delicious milk chocolate/crisp butter toffee.’ It is smaller than most candy bars but just as delicious. In fact, I enjoyed one today and it was every bit as tasty as I remembered. On to the facts. History: Hershey’s created Skor in 1983 to compete with the Heath bar. In 1996, Hershey’s bought the company that made Heath bars. Now they are made in the same factory (check out the bibliography for a comparision of the two). The crown on the wrapper is from the Swedish national emblem, the Tre Kroner (Three Crowns), seen on the Swedish coat of arms. Competition: The most similar bars would naturally be other toffee candy bars. Both the Heath bar and the Daim bar are similar.